£1 million in bingo prizes up for grabs this September! 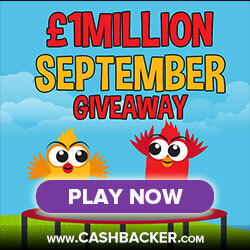 Fancy getting your hands on a share of £1 million this September? Of course you do! Read on to learn more..
With six bingo sites involved; whether you’re devoted to Bucky Bingo, or play exclusively with Betfair Bingo, you have no excuse not to get involved. Six of the most popular bingo websites have come together (much like the popular Bingo Linx tournaments) to generate a prizepool like no other. All the above are some of the most popular bingo sites on the web. Of course, we appreciate players have their favourites, so the great news is that you only need to play at one of the above to get involved. How to enter the £1 million bingo giveaway! Basically, all you need to do is spend £5 or more at one of the bingo rooms above between the 2nd and 22nd of September to earn entries into the weekly prize draws. Every £5 you spend results in one entry earned, which means the more you play, the more chance you have of winning a share of the weekly pot. Week 1 (2nd to 8th September): £200k to be shared! Week 2 (9th to 15th September): £300k to be shared! Week 3 (16th to 22nd September): £500k to be shared! Well, apart from the fact you can earn double entries by playing in specific rooms! Make sure to take advantage of double entries! During week 2 and 3 play in the ‘Network Speed 90 Room’ for double entries. Play in their ‘Cash Cubes’ room during week 1 or their ‘Network Speed 90 Room’ during weeks 2 and 3 for double entries. Play in their ‘Cash Cubes’ (week 1), Turbo Gold (week 2) or Gold Rush (week 3) for double entries. Play in their ‘Cash Cubes’ (week 1), Swift Bingo (week 2) or Megamax Room (week 3) for double entries. Play in their ‘Cash Cubes’ (week 1), ‘Need for Speed’ (week 2) or Peggy’s Place (week 3) for double entries. Betfair Bingo will be announcing their double ticket rooms as the weeks go on, so head on over to their website and sign-up for more information! And that’s pretty everything you need to know about the £1 million giveaway! Good luck and remember to take advantage of those double entries!